The perfect French toast should be soft and creamy on the inside and golden and crispy on the outside. Most often served as an indulgent weekend brunch, the dish is a great way to use up leftovers – with the most basic recipes requiring just eggs, milk and bread. It is preferable to use stale bread as fresh bread has a tendency to fall apart when dipped in the custard. Stale white bread is usually used but this can be substituted for brioche or challah for a slightly more indulgent treat. For savoury French toast, omit the sugar and vanilla and replace with a little salt and pepper; it makes a great snack for kids or part of a weekend fry-up. 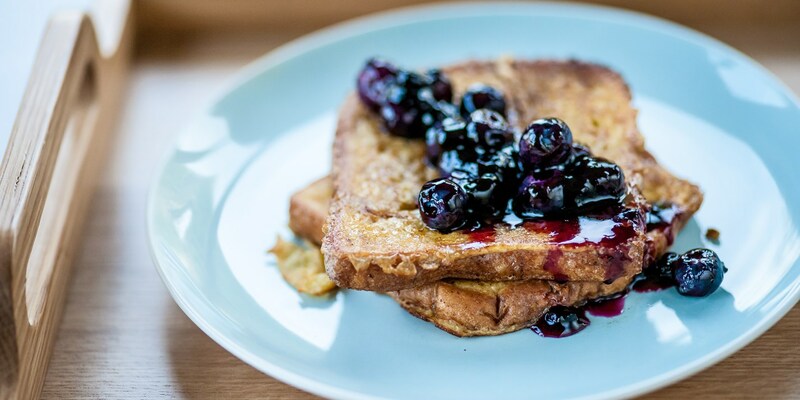 French toast is one of those dishes that blurs the boundaries between sweet and savoury. For example, Peter Gordon serves Spiced banana French toast with smoked bacon, chilli labne, tamarind caramel. For a sweeter pairing, see Shaun Hill’s Cinnamon French toast with wimberries or Colin McGurran’s simple version served with raisins, honey and yoghurt.